In this article we will discuss about CloudFormation, it is kind of orchestrator on AWS Cloud Platform. CloudFormation is an AWS service that helps you to model and setup your cloud resources so that you can build you infrastructure in less time and you can focus on your development work. Cloud Formation(CF) gives System administrators & Developers an easy way to create and manage a collection of related cloud resources, provisioning and updating them in an orderly and predictable fashion. CF allows organizations to deploy, modify and update resources in a controlled and predictable way, in effect applying version control to cloud infrastructure the same way on would do with software. You can create CF templates to define you cloud resources and their properties. A template is a text file whose format complies with the JSON or YAML or start from many available sample templates. 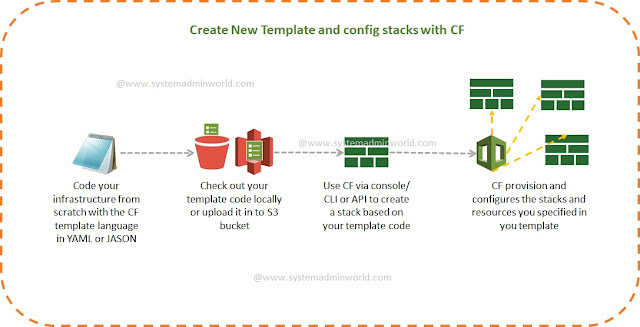 CF uses these templates as blueprints for building your cloud resources. You can code your infrastructure from scratch with the cloudformation template language, in either YAML or JSON format, or start from many available sample templates. you can check out your template code locally, or upload it in to an S3 bucket, once template is created and check out by using CF Cloud service using browser console, command line tools or API's to create a stack based on your template code, finally you can CF provisions and configures the stacks and resources you specified on your template. You may need to update your stack's resources from time to time. there is no need to create a new stack and delete the old one, you can simply modify the existing stack's template. 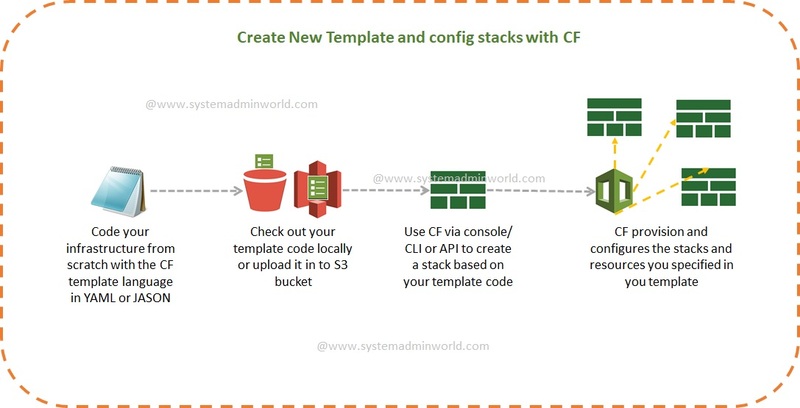 To update a stack, create a change set by submitting a modified version of the original stack template, different input parameter values, or both, CF compares the modified template with original template and generates a change set. The change set lists the proposed changes. after reviewing the changes, you can execute the change set to update your stack. below diagram will explain you how update process will work. Launch Application in New Cloud Regions, a single script can be used across multiple regions to launch stacks reliably in different Cloud regions. Quickly Launch new test environments, cloud CF lets testing teams quickly create a new environment to run tests without disturbing ongoing efforts in other environments. Reliably replicate configuration between environment, because CF scripts the entire environment, human error is eliminated when creating new stacks.